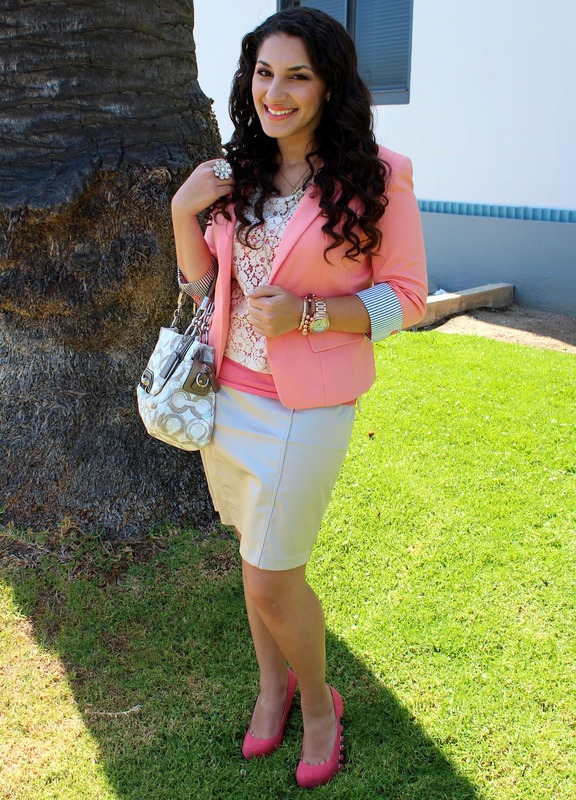 This outfit of the day definitely has a coral focus! I wore this coral blazer and satin, light gray pencil skirt ensemble to Church and attended a Graduation Party with it right after. I've been obsessed with coral this summer and have finally found the perfect coral blazer. I especially love its satin black and white striped cuffs! 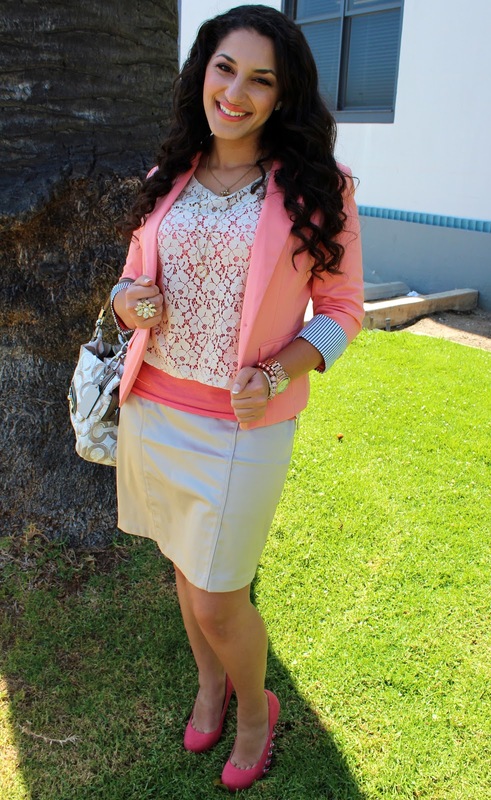 The coral blazer and cream, lace blouse are from a local Fashion Q boutique. The coral cami underneath and the satin gray pencil skirt are both from Forever 21. White and taupe purse is Coach. I especially love the lace blouse because of the cute bows in the back! The salmon colored pumps are the "Guadalupe" style from JustFab.com and the side buckle detailing and coral color drew me in right away. For accessories, I'm wearing my rose gold Michael Kors Watch, Jewelmint Bow Tie bracelet, and a Baublebar rose gold wrap bracelet. I'm also wearing the magnifying glass necklace from the Jewelmint Victorian Charmer necklace set, a vintage gold cross necklace, and a cream flower ring that was gifted to me. For makeup, I decided to play with some colors. Stila "In The Light Palette": Bare (matte cream) under brow and in inner corner as highlight and Bliss (matte light brown) to blend out crease. Mac Call Me Bubbles Quad (LE): Brash (bronze) on inner and outer third of lid, Fresh Daily (light orange) on center of lid, and Full of Flavour (coral/pink) in crease. Mac Ever Hip Lipstick (LE) with Revlon's Coral Reef gloss on top.